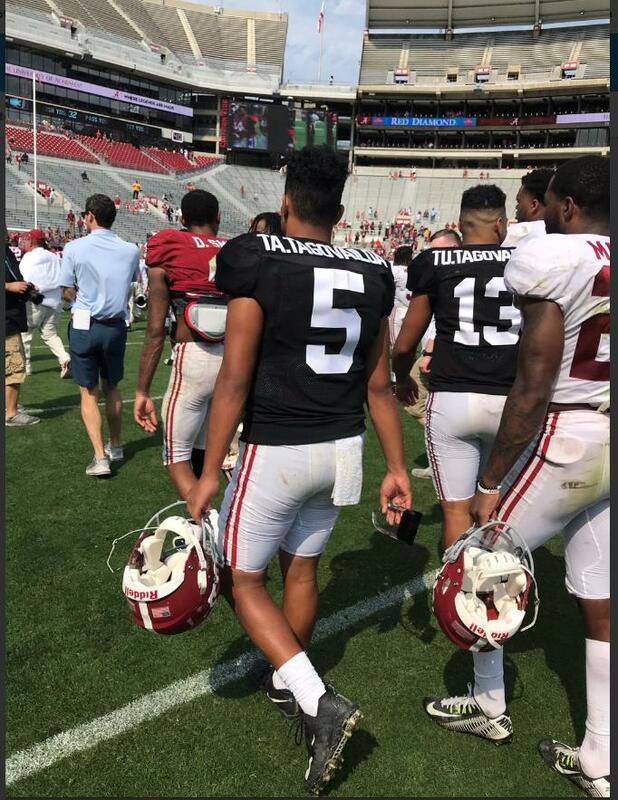 Rundown of Alabama spring award winners Al.Com - By Matt Zenitz | mzenitz@al.com Alabama handed out its spring awards after the team’s spring game on Saturday. I have yet to watch the recording of the game, will try to watch when I get home after work this afternoon. I am mostly concerned with watching the 1's against the 1's. I know the playbook was pared down but, really want to see the 1's up close. Has anyone heard about the possible injury to Najee from the head 1st landing he made? I was impressed by his balance when he was able to catch himself and continue the run; but was really worried that he could have really jammed his neck. Guess we will hear something on Monday if there is an issue. I say we call him "THREEah". Taulia could start as a FR RS and be here for 4 years. That's basically 6-7 years with a Tagovailoa as our QB. You think we see either of them this year and utilize the 4-game redshirt rule? Yes, I think we will see all of them play a little with the 4 game redshirt rule. After that I believe the one that rises above the rest will play in mop up duty and the other will take a redshirt. Tua seemed a little ginger on his leg after a re watch. I’m curious now. ESPN commentators pointed that out several times. There's definitely something going on, but perhaps something from spring practice. I honestly think he was just being over cautious and not trying to get it stepped on. Mental hurdle he'll have to get over. I was honestly chalking it up to that. He may have also tweaked it at some point. This summer will be big for strengthening that knee area and hopefully getting him fully right for Fall.